I have tried many of the competition's Nitrous pressure Gauges and they don't even come close to the DynoTune model. Note: The Sending unit come with 1/8" NPT threads. 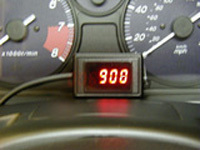 The Gauge adaptors are sold seperately, available in 4AN and 6AN.